WineGuyMike™ will be giving away gift certificates from our sponsors. If your question is selected as WineGuyMike’s™ topic of discussion you will win one of the $20.00 – $25.00 gift certificates. Good luck and send your questions to WineGuyMike™ on his Facebook fan page. This week’s question was submitted by Deb Motl. Q. Deb Motl asks; I have been wondering about the process of decanting verses just letting a bottle breathe. Do you only need to decant older bottles of wine or is it beneficial for all red wines in general. Also, would the new aerators achieve the same results as decanting? A. Deb thank you for such an interesting question. Here are my when’s, why’s, and suggestions, let’s hope these make some sense. I’m also going to take the liberty to talk about some old school traditional decanting that I think you will find interesting too. So let’s start with when I would use an aerator. 1. When spontaneous guests showed up. 2. When I’m drinking an average bottle of wine that is perhaps something I drink daily, these can always benefit from an aerator. 3. At a restaurant, doesn’t every wine geek travel with their wine aerator? I know I do, LOL. 4. Aerators are typically fine to use with New World younger wines that are not aged Sur lie. Lees are the sediment left behind in a bottle that is unfiltered as a result of being aged Sur lie. 1. When I was serving or drinking a good quality wine. 2. When I ordered a good bottle of wine at a restaurant that decanted their wines. Deb my reasoning is this; I believe that an average quality bottle of wine will benefit from being “whipped” and “oxygenated” by an aerator as it will bring out the best that bottle has to offer. If unexpected guests show up you may feel the need to be immediately hospitable and open a bottle of wine to share with your guests. In this case I would use an aerator. Many restaurants do not offer to decant your wine for you. If they are wine focused they will have decanters and will offer to do this for you, after all they should do all they can to satisfy your dining experience. The reality is that many establishments don’t decant and I would not hesitate to ask your server to use your wine aerator. Be sure to offer to show them how to use the devise, many servers may be unfamiliar with them and they will appreciate your kindness in demonstrating how to use it. With this approach they will be fully engaged in your dining experience with you. Step away from the good to great bottle of wine with your aerator, why you might ask. I don’t want my fruit bruised. I mean this sincerely if you have a great bottle of wine you have probably made some special plans around this wine event even if it just you and your partner enjoying a great bottle of wine on a special occasion. By all means use a decanter and aerate your wine with a decanter. You will notice that when a wine is poured correctly by letting it pour into and gently grazing the side of the decanter bottle neck so the wine spreads itself onto the walls of the sphere within the body of the decanter. While pouring the wine into the decanter you will not pour the sediment from the bottle into the decanter. If you are using an aerator you may potentially blend the sediment into the wine thus potentially altering the juice from a high end bottle of wine. If you have the opportunity to dine in an upscale restaurant that has a Master Sommelier on staff they have an almost ritualistic approach to decanting a wine properly. First they will carry the wine from their wine cellar in a specially made basket. The basket carries the wine at the same angle it was stored at in the wine cellar. You will notice that the sommelier is very gentle as he brings the wine and places it on the table still lying prone in the basket. The sommelier will gently wipe the dust from the top of the bottle to remove dust from the wine cellar. They will now remove the foil cap from the bottle and place it in his or her jacket pocket and then once again gently wipe the exposed cork still in the bottle. Now the cork removal will begin, but once again very gently and only about 80% of the way and then the sommelier will use his or her hand to gently express the cork. They do this so the air hits the bottle slowly and does not cause the wine to spray out of the bottle. Once the cork is removed with the bottle still in the basket in a prone position the sommelier will present the cork to the person who order this wonderful bottle of wine to go with their meals from this fine dining establishment. Once the guest has examined the cork visually to make sure the cork has not gone bad from being stored improperly and that the bouquet being expressed from the cork meets their approval the sommelier will now light the candle that has also has been placed at the table. You will notice that the candle is of equal height of the decanter that is being used. The sommelier will now very gently lift the bottle of wine from the basket and begin to gently and somewhat slowly pour the bottle of wine into the decanter. While the wine is being poured the sommelier will have the candle placed under the bottles neck about an inch and a half away but yet close enough to the bottle so that they may see the wine passing from the bottle to the decanter. This is done so if and when there is sediment in the bottle they will not allow that to pass into the decanter. The bottle will then be place back onto the table with the sediment still remaining in the bottle and all the incredible wine in the decanter aerating and waiting to be poured into the glasses of those anxious and now completely tantalized palettes. Deb that is the rest of the decanted story, cheers to you and your great question. This week’s wine recommendation from WineGuyMike™ comes fromthe Wahluke Slope AVA which was established in 2006. The Wahluke Slopes boundaries are the Columbia River on the west and south, and the Saddle Mountains to the north, with the Hanford Reach National Monument to the east. This AVA is entirely within the Columbia Valley appellation and home to more than 20 wineries. There are 5,652 planted grape acres in this area which represents about 15% of the wine grape acres in Washington State. The Wahluke Slope has one of the driest, warmest climates in the state and produces Merlot, Syrah, Cabernet Sauvignon, Riesling, Chardonnay, and Chenin Blanc as the main varietals from this area. Inspired by last week’s blog post I decided to go shopping for a wine from the Columbia Valley and came home with a Bordeaux blend from the Wahluke Slope AVA in Washington State; 2008 Desert Wind Ruah. What a great find, this is a nicely balanced red wine blend driven by Merlot with an almost equal amount of Cabernet Sauvignon for a little backbone with a touch of Cabernet Franc squeezed in the middle to blend. This is a medium bodied wine that is a bit tannic with an ever so slight hint of vanilla, concentrated fruit that opens up all the way to the finish line. On the kick off this wine hits you right up front with red currant, and then shifts to black cherry. The tannin picks up right on the fifty yard line and then it’s a strawberry and raspberry hand off that runs all the way to the goal line, but it doesn’t stop there it runs through the tunnel and all the way into the locker room. This wine has nice viscosity, a clean, clear, dark red cherry jello coloring that is as pretty to look at as it is to drink. It is very nice to drink now but I would recommend lying this down for two years and it will really finish in the bottle what the winemaker began. If you can’t resist like me I would recommend decanting this gem from the Wahluke Slope, this wine does have a sense of place, terrior to you. Thanks to Desert Wind Winery for producing really nice affordable wines. The Desert Wind Winery is an amazing destination wine property the you will not want to miss visiting. Please visit their website www.desertwindwinery.com to see what I’m talking about. Rub meat with oil and pepper, and place in an open roasting pan. Insert meat thermometer so tip reaches center of thickest part. Arrange onion, carrot and celery slices around meat. Pour wine over meat and vegetables. Place in oven and cook uncovered 1 1/2 hours, or until meat thermometer registers desired degree of doneness. If more liquid is needed, baste with additional wine during the roasting period. Do not use drippings from the roast for basting. Skim fat from pan juices or remove juices with bulb baster and discard fat. Remove meat from pan and slice thin. Spoon pan juices over meat and serve immediately. Q. Urban asks; Mike what is a good “quick and dirty” trip to Washington wine country? A. Well my friend Urban I’m going to have to immediately recommend the Columbia Valley in Washington State. When I was young I used to dream of living in the wine country, of California that is. Here I am a “few years” later and you know what I do live near the wine country, in the Northwest United States. Oregon and Washington are arguably some of the best wine regions in the world. Quick and dirty Urban for me is the Columbia Valley, just a short trip from Western Montana. Almost right in our backyard, oh that’s right it is our backyard. Back when Missoula was Lake Missoula and flooded and took its alluvial soils with it to Washington. Layers of soil blessed with the alluvial soil material and layers of volcanic ash and rock that have created amazing soil to grow grapes in. The days are warm to hot and the night air is cool, perfect for growing world class grapes that make fabulous wines. There are well over 100 hundred wineries to visit within a 60 mile radius of the immediate Columbia Valley. Urban if you really want something down and dirty try a short road trip to Spokane, there are 27 tasting rooms in Spokane featuring the wines of the Columbia Valley and other viticultural regions within the greater Columbia Valley. Once you get there I think this may qualify as a wine trail hike to move from one tasting room to another, all kidding aside a road trip is well worth a small effort for those of us residing in Western Montana. The Columbia Valley AVA was established in 1984 and it is Washington State’s largest viticultural region covering 11 million acres and which is nearly one third of the state’s land mass. 99% of the grapes that are grown in Washington State come from the Columbia Valley. There are many meso-climates and micro-climates within this vast valley. Most of the vineyards in the valley are planted on south facing slopes which provide better sun exposure and allows the air currents to flow through the vineyards during the sometimes harsh winter months. The varietals that are most prevalent in the Columbia Valley are Cabernet Sauvignon, Merlot, Chardonnay, and Riesling. The Columbia Valley is home to the American Viticultural Regions of Red Mountain, Yakima and Walla Walla Valleys, Wahluke Slope, Rattlesnake Hills, Horse Heaven Hills, Snipes Mountain, and Lake Chelan. An AVA is a grape-growing region that is defined unique geographic features. These regions are designated by The Alcohol and Tobacco Tax and Trade Bureau (TTB) at the request of wineries and other petitioners. America’s counterparts overseas known as European appellations dictate the type of grapes grown, how the wines are made, and in some cases the amount of grapes harvested. AVA’s do not interfere with grape growing, picking, or wine making. Now we’ll travel through the other viticultural regions of the Columbia Valley that are also AVA’s because of their distinguishable geographic features that were identified by the petitioners and recognized by The Alcohol and Tobacco Tax and Trade Bureau. The Yakima Valley AVA was established in 1983 and was Washington State’s first appellation recognized by the Federal Government. There are more than 60 wineries in the Yakima Valley. Vineyards are planted on 16,042 acres, this is more than one third of the states vineyard acres. Cabernet Sauvignon, Merlot, Chardonnay, and Riesling are the most popular varitals in this AVA but Syrah is really on the rise. The Yakima Valley has soil that contains silt and loam is very favorable for grape vines as it allows for the type of drainage necessary to grow great grapes. The Yakima Valley is also noted for great fruit production other than grapes as well. In the Walla Walla Valley AVA that was established in 1984 grape growing began in the 1850s by Italian immigrants, what does that tell you? There are over 100 wineries in this region that have planted vines on over 1,600 acres. The predominant varietals are Cabernet Sauvignon, Merlot, Chardonnay, and Syrah. Sangiovese grows very well in Walla Walla which is why the Italians chose this area I can promise you. But here are some of the other varietals that are becoming known in this region; Gewurztraminer, Cabernet Franc, Grenache, Malbec, Petit Verdot, Tempranillo, Pinot Gris, Riesling, Sauvignon Blanc, Semillion, and Viognier. The soil in this region like others in the Columbia Valley are the result of layers of alluvial soil from the Lake Missoula floods and volcanic eruptions. This type of bedrock creates incredible growing grounds for grapes. The Puget Sound AVA which was established in 1995 is very small encompassing only 69 acres of planted grapes, but there are 45 wineries within this region which makes wine tasting easily accessible and fun. This region due to the maritime influence has mild summers and mild winters. This appellation whose main varietals are Madeleine Angevine, Siegerebbe and Muller-Thurgau with Pinot Gris and Pinot Noir looking promising is drier and has more sun then other comparable grape growing regions in Europe. Beneath the top layer of soil is a semi-permeable sub-soil that allows these deep rooted varietals to survive the late summer soil moisture deficit. The Red Mountain AVA was established in 2001 on the eastern edge of the Yakima Valley. There are 1,199 acres of grapes planted in this region on steep slopes that face Southwest toward the Yakima River. There are 15 or so wineries in this area and their focus are on the Cabernet Sauvignon, Merlot, Cabernet Franc, Syrah, Sangiovese, Malbec, and Petit Verdot varietals. This is a desert climate with growing season daytime temperatures average 90 °F with night time temperatures dropping below 50 °F. The Columbia Gorge AVA was established in 2004 includes areas in Washington State and Oregon with more than 20 wineries in the area. This is a 300 square mile area with 191,000 acres. There are only 500 planted acres on vines. The region parallels the Columbia River in both Washington and Oregon. The Columbia Gorge and the southwestern part of the Columbia Valley American Viticultural Areas are in this region. The Columbia Gorge is dramatic transition from high eastern desert to cool maritime climate as the Columbia River runs through Cascade Mountain Range on its way to the Pacific Ocean. The Columbia Gorge provides perfect soil, climate, and geography with distinct micro-climates that host almost every varietal imaginable. As rainfall diminishes at almost an inch per mile in this region sunshine increases at exponentially. The Western vineyards have a maritime influence perfect for cool weather varietals like Pinot Noir, Gewurztraminer, Chardonnay, Pinot Gris and Riesling. The high desert Eastern vineyards are home to varietals that thrive with less rain and hot sun Bordeaux, Rhone and Italian varietals like Cabernet Sauvignon, Syrah, Zinfandel and Barbera. Here is the extensive list of varietals grown in the Columbia Gorge; Albarino, Aglianico, Barbera, Cabernet Franc, Cabernet Sauvignon, Chardonnay, Dolcetto, Gamay,Gewurtztraminer, Grenache, Gruner Vertliner, Lemberger, Malbec, Marsanne, Merlot, Mourvedre, Muscat, Nebbiolo, Pinot Blanc, Pinot Gris, Pinot Noir, Primitivo, Riesling, Roussanne, Sangiovese, Sauvignon Blanc, Syrah, Tempranillo, Viognier, White Riesling and Zinfandel. All I can say is wow and let’s hit the road Urban. The Horse Heaven Hills AVA was established in 2005 is located in Southeast Washington State bordered by the Yakima Valley to the North and the Columbia River on the South. 25% of Washington State’s grape production comes from this region which is planted with 10,130 acres of grapes. Predominate grape varietals include Cabernet Sauvignon, Chardonnay, Merlot, Syrah, and Riesling. There are 37 total varietals represented is this region the vines are on steep south facing slopes that have sandy-loam type soil that provides great drainage for the vines. Because of the proximity to the Columbia River this region receives constant brezes that moderate the temperatures. The elevations in this region range from 1,880 feet in th North to 300 feet in the southern portion. When visiting this area these are a few of the outstanding wine properties you should make a point of visiting; Alder Ridge, Andrews-Horse Heaven Vineyard, Canoe Ridge, Champoux Vineyards and Wallula Gap Vineyard. There are 25 vineyards and 6 large commercial grape growing operations. It is important to note that this region produced the first three “100 point” wines for the state. The Wahluke Slope AVA was established in 2006 with its boundaries are the Columbia River on the west and south, the Saddle Mountains to the north, and the Hanford Reach National Monument to the east. This AVA is entirely within the Columbia Valley appellation and home to more than 20 wineries. There are 5,652 planted grape acres in this area which represents about 15% of the wine grape acres in Washington State. The Wahluke Slope has one of the driest, warmest climates in the state, allowing nearly complete control of vine vigor and ripening through irrigation. Merlot, Syrah, Cabernet Sauvignon, Riesling, Chardonnay, and Chenin Blanc are the main varietals being produced in this area. I personally love what the grapes extract from the soil in this region, a true sense of place. The Rattlesnake Hills AVA was established in 2006 and is only four miles southeast of Yakima. There are 1,566 planted grape acres in this area. The Rattlesnake Hills AVA lies within both the established Columbia Valley and Yakima Valley appellations with an elevation beginning 850 feet and rising up to 3,085 feet. There are 17 wineries and 29 vineyards which are typically located on ridges and terraces. This provides good air drainage that protects the vineyards from late spring and early fall frost and winter kill. The primary varietals you’ll find in this area are Cabernet Sauvignon, Malbec, Merlot, Syrah, Chardonnay and Riesling which are sourced by producers from around the state. Ben Snipes was a rancher who built a house and settled his cattle operation on a Yakima Valley mountain north of the Yakima River in the 1850’s, which later known as Snipes Mountain. The Snipes Mountain AVA was established in 2009 and this area also includes Harrison Hill to the east. Both of these slopes have rocky soils at elevation. There are 759 of planted grape acres in this area that is home to 30 different grape varietals used by 25 wineries. Six Wineries are located in the Snipes Mountain AVA. The topography, elevation, and soil are unique within the Yakima Valley AVA. Lake Chelan is a very desirable summer destination in Washington State who’s AVA was established in 2009. This AVA is situated at a high elevation with a moderate lake effect climate that is more temperate than AVA’s located in the southern portion of the Columbia Valley. Soils in this area are a result of glacial alluvial soil matter that is coarse, sandy sediment with significant quartz and mica minerals. The result is wine with distinct textures and minerality. The Lake Chelan AVA includes southern and eastern portions that surround the lake and shares a northern border with the Columbia Valley AVA. I have enjoyed a incredible Viognier from this area. There are 227 of planted grape acres in this area that was originally farmed by Native Americans and Italian immigrants at the beginning of the 20th Century. 15 wineries are located in this AVA producing wines from the Syrah, Merlot, Malbec, Riesling, Pinot Gris, Gewurztraminer, Chardonnay, and Pinot Noir varietals. The Cold Creek sub-region benefits from a southerly facing slope of the Columbia River which enjoys one of the longest growing seasons in the Columbia Valley. Little rainfall and soil consisting of silt loam produce very intense and concentrated fruit. Cold Creek is part of a high plateau that runs along the south side of the Columbia River and is particularly noted for its Chardonnay and Cabernet Sauvignon. The Columbia Basin/Snake River sub-region is where the Columbia, Yakima and Snake rivers meet. The area surrounding the Tri-Cities, which includes the broad hills bordering each side of the Snake River, is benefited by a good climate and ample irrigation. Several large vineyards have achieved reputations for excellent Merlot, Sauvignon Blanc, Semillon and other varietals. 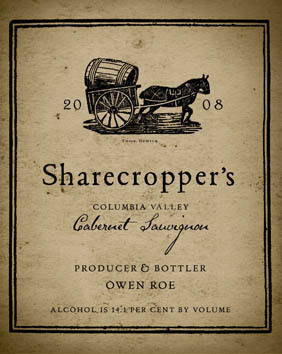 The fruit for the 2008 Sharecropper Cabernet Sauvignon is all Columbia Valley AVA. With a beautifully long Indian summer the 2008 vintage yielded perfectly ripe fruit with lithe bright acidity. This wine has a beautiful nose ripe with blueberries, black currants, dark cherries and wild strawberries. A nice long finish lingers with flavors of licorice, olives and cedar. Muscular, but not a brute, firm tannins and elegant structure will let this wine age beautifully over 4-6 years. Chuck Reininger on is 2005 Helix Cabernet Sauvignon: “Yoga for the Palate! Permit this wine to reelaxxx for awhile. While sitting straight up with eyes closed, focus on the Helix (the wine and the shape) by swirling the Cabernet around on your palate. Without swallowing, gently inhale once or twice to unravel the fruit in this wine. You’ll discover black raspberry, plum and cassis layered with caramelized oak, a barely perceptible hint of clove and very fine tannins. Swallow. Exhale. Life is gooood.” With only 784 cases made, and riding on the platinum lined shirt-tails of the 2004 Helix Cab, this wine is bound to vanish quickly. Rated as one of the top 100 WS wines for 2010 it tastes like really, really good red wine. This wine is rounded, lush, layered and lovely, the ultimate food wine, pairing well with everything from pasta and pizza to grilled meat and roasted chicken. Bright with fruits of raspberry, currant, mocha, a touch of pepper spice, soft tannins and a lingering finish… year in and year out, it’s like partying with an old friend. Generous aromas of ripe berries and dark stone fruits open this ruby-hued wine. Fleshy flavors of cherries and plum are met with soft and velvety tannins, finishing with a hint of mocha. This wine is made predominantly from the varietals Syrah, Merlot, Petit Verdot and Mourvedre. WineGuyMike™ is going to explain a very complex area of wine as simply as I’m able to. Do not let this topic be overwhelming but please take a moment to read this blog post, it will give you the information you need to filter through all the minutia and have the knowledge to make wise purchasing choices for your special Valentine Day celebration. At the very end of this blog post I will have a list of wines for you to consider along with a few pairing suggestions. You might ask what are Champagnes and Sparkling Wines? These wines as I will refer to them are just that, although they have been carbonated in some way shape or form. This is process that you need to know about, it is an important part of your decision making process when it comes to actually making a purchase. The other important thing that you need to know is; what is the “compromise” style of sparkling beverage that my Valentine and I will both enjoy on this all important day of romantic celebration. So let’s dig in and let me give you the scoop on what you need to know to go to the store and walk up to the shelf with confidence and make that choice. Champagne is from the Champagne region of France. This regions entire focus is on just that and that is why it is so good. There are three grapes that they use in their Champagne; Pinot Meunier, Pinot Noir, and Chardonnay. The juice from these grapes from different years are blended together, bottled, taken care of by hand and laid down in cool caves to become what we know as the bottle of Champagne we drink for special occasions in our lives. Champagne that has a slightly pink color is still terrific to drink. This occurs during the fermentation process. The juice of the pinot noir grape is left with its skins for a short period of time and the skins impart a slight coloration to the grape juice. This is how they create the color in Pink Champagne. Champagne known as Blanc de Blancs is made from 100% Chardonnay and is one of WineGuyMike’s™ favorite Champagnes. Now we know there are three different types of Champagne but what are the different types? This is where the compromise comes in when celebrating a special occasion with your Valentine. Nothing dampens an intimate celebration of your relationship faster than a wine that is to dry or to sweet for you or your partner. So please consider this prior to making your purchase. Let’s talk about the quality of the bottle you are purchasing and what information you need to know about this. There are three things you need to know and on the label it will mention or not a few things that speak to the quality of the wine which will be reflected in the price. Prestige cuvee or Tête de Cuvée – this is the very best juice that has also been aged the longest of all Champagnes. This is also going to be the most expensive. Vintage Champagne – some years produce an outstanding grape harvest and there will be a Vintage Champagne as a result. These bottles have been aged at least three years. This will actually be noted on the label as it will have the vintage or year that it was produced on the label. These are also expensive bottles of Champagne. Non-Vintage Champagne – The majority of Sparkling wine on the shelf of a store is non-vintage. These are a blend of wines aged for two years. These are typically what I and the general consumer drink. These are still incredible Champagnes because they are produced in the traditional method or as it is known in the wine industry; Méthode Champenoise. M´ethode Champenoise is industry term that signifies the traditional method of making Champagne. The wine is fermented twice, once in an oak barrel, and the second time the wine developes carbonation in the bottle while aging a minimum of one year. Sparkling Wine is also carbonated wine that is not produced in Champagne France. The quality of this wine can vary widely depending on how it is produced and what the intent of the production was. Sparkling wines may use some of the three traditional Champagne grapes; Pinot Meunier, Pinot Noir, and Chardonnay. Typically a wine maker will also use grapes that are common to the region in which they are located; this does not mean that it won’t be good quality. The best Sparkling Wines will be made using what will be noted on the label, “traditional method”, M´ethode Traditionnelle or you may see M´ethode Champenoise but that term is becoming less popular to use on Sparkling wine labels. So this and the information we covered in the Champagne section of this blog post is really what you need to know about Sparkling wines. Remember the same terms, quality designations, and types of wines apply to Sparkling Wines apply to your purchasing decisions. Now we are going to talk about “other” Sparkling wines. There are three that I’m going to address for you. The three that are important for you to know about are Prosecco, Cava, Asti Spumante, and Moscato d’Asti. Prosecco is an Italian wine, generally a dry sparkling wine, usually made from grape variety Glera, which is also known as Prosecco. The Veneto region of Italy is where Glera/ Prosecco is grown and produced. Prosecco is made using the Charmat method rather than the Champagne method, the French method of making sparkling wine. The Charmat method is a second fermentation in pressurized tanks rather than in individual bottles. The shorter, tank fermentation is preferable for Prosecco because it preserves the freshness and the flavor of the grapes. Prosecco is Italy’s answer to refreshing, well-made, sparkling wine that is low in alcohol, about 11 to 12 percent by volume. Created from predominately Prosecco grapes in the northern Veneto region of Italy in the foothills of the Alps. Prosecco is light, affordable, and fun. This Sparkling wine is aromatic and crisp, with nuances of yellow apple, citrus, pear, white peach, and apricot. Today’s Proseccos tend to be dry and very bubbly and typically will present itself as light, fresh, with an initial intense bouquet/aroma, but simple and straight forward compared to Champagne. Asti Spumante is a sweet sparkling wine with a mellow effervescence. It is produced in the province of Asti and made from the Moscato grape. Spumante is a fruit forward sparkling wine that is grapy, and has a low alcohol content usually around 8% . Moscato d’Asti is a sparkling wine that is frizzante in style and for my palette I find these wines to be made in a more refined style than the Asti Spumante. The Moscato d’Asti is an aperitif or dessert wine though and will definitely be on the sweet side. I use this wine as an opener or a closer but not an all evening drink of choice. Cava originated in the Catalonia region at the in the late 19th century. Originally the wine was known as Champaña until Spanish producers officially adopted the term “Cava” (cellar) in 1970. Cava wines are fermented and aged in the bottle in underground cellars. Today 95% of Spain’s total Cava production is from Catalonia. Crémant is produced in the Loire Valley of France and is the largest producer of sparkling wines outside of the Champagne region. Crémant has to be aged for at least one year and it is handpicked. The producers are also limited as to how much can be harvested, this all according to the French A.O.C. Crémant de Loire’s are a blend of the Chardonnay, Chenin Blanc and Cabernet Franc. In Burgundy, Crémant de Bourgogne, must be composed of at least thirty percent Pinot noir, Chardonnay, Pinot Blanc or Pinot Gris while Aligoté is often used to complement the blend. The Languedoc region in the south of France produces Crémant de Limoux. This Sparkling wine is produced from the indigenous grape Mauzac, with Chenin blanc, and Chardonnay rounding out the wine in small amounts. The Crémant Sparkling Wines are pressurized less than Champagne and therefore have a larger looser bubble as a result. WineGuyMike’s™ recommendation is to determine your price point for your purchase and with all the information you have learned from this post you will be able to make a knowledgeable selection and not just a guess. One of the very best bangs for the buck is Cava. It is a terrific Sparkling Wine that is made in the “traditional method”, or M´ethode Traditionnelle. For me this is a great budget selection. You will be able to find great selections from $6.00 to $15.00 that are sure to satisfy. Schramsberg 2007 Brut Rosé is flavorful, complex and dry, making it both versatile with food and delicious by itself as an apéritif. The character of the wine is most strongly influenced by bright, flavorful Pinot Noir grown in Carneros, Anderson Valley, and the Sonoma and Marin coastal areas. A few small lots of Pinot Noir are fermented in contact with their skins to add depth and subtle color to this unique sparkling wine. Chardonnay gives spice, structure and length on the palate. The non-vintage Gosset Brut Grande Reserve Champagne is delicious, dry and flavorful, sporting citrus, spice, apple and pear flavors on a firm, lightweight frame. Argyle 2007 Brut – 90 PT. Wine Spectator Rating, 63% Oregon Chardonnay, 37% Oregon Pinot Noir, Sparkling Wine Knudsen Vineyards, Lone Star Vineyard Willamette Valley AVA, Willamette Valley, Oregon ($25.00) Prepare to be fascinated by this alluring sparkling vintage. The aromas are a weaving together of the best that fine sparkling wines deliver. Look for vanilla spiced pear fruit with very floral citrus blossom scents. A lovely yeastiness blends nicely with fresh baguette bouquet. There’s a hint of Fresca-like citrus in there too. The palate is VIBRANT and chock full of tiny bubbles. Pear to red apple fruit folds nicely into vanilla spice. The texture is creamy-plus, providing amazing richness while remaining zippy and citrusy. The yeast flavor has evolved into filo dough right out of the oven. These flavors go on and on after the wine is gone. Saint-Hilaire($12.99) – Blanquette de Limoux is probably the oldest sparkling wine in the world. We know that in 1531, the Benedictine Monks of the Abbey of Saint-Hilaire were already producing Blanquette de Limoux which certainly makes it France’s Oldest Sparkling Wine preceding Champagne by more than a century. The Limoux vineyards are located in Languedoc, in Southern France, at the foothills of the Pyrenees Mountains. The grapes are selected from clay-limestone plots that capture both the Oceanic and Mediterranean influences. Crémant d’Alsace Brut Lucien Albrecht – Grape: Pinot Auxerrois and Pinot Blanc. Origin of the grapes: the vineyards on clay-chalky soil are all in the Orschwihr commune, a large vine-growing area in Southern Alsace which has an early micro climate. Crémant d’Alsace Brut Lucien Albrecht is only produced from the cuvée (only the first pressings from the press). – attractive sober colour, flowery nose, fine and persistent head, very elegant and balanced mouth. Notes of fresh toast, fresh apple and a hint of peach. This full-bodied and very wine-like bubbly combines flavor with a ton of finesse. 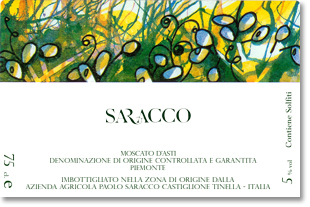 Saracco Moscato D´ Asti ($15.00’ish) – Perfume of fresh peach, pear and aromatic white flowers. A gentle sparkle brightens the fruit and a tingle of sweetness hints of candied fruits. This wine is perfect as refreshing aperitif or a light finish to a meal. Saracco has perfected the balance of acid and residual sugar to make an incredibly light and floral sparkling wine. Moderately fine, persistent, and frothy mousse. Lovely, elegant scents of green apples, white wildflowers, minerals, and glazed almonds. The palate is dry but still generous with flavors of yellow cherries and tropical fruits, and a very long finish. This Sparkling wine is aromatic and crisp, with nuances of yellow apple, citrus, pear, white peach, and apricot. Banfi Rosa Regale is crafted from 100% Brachetto grapes grown exclusively at the La Rosa Vineyard in the town of Acqui Terme located in the Piedmont region of Italy. The label features a single red rose, representing the wines origin from this single vineyard La Rosa estate. Segura Viudas Brut Reserva – ($5.99) Segura Viudas Brut Reserva, created from a blend of reserve and non-vintage wines, is clean and delicate, yet rich in flavor. A cuvée of Macabeo, Parellada and Xarel-lo grapes grown in the renowned Alt Penedès region of Spain, the wine is vinified according to méthode champenoise technique and is aged in the bottle for a minimum of three years. This fine cuvée is fairly crisp with an interesting floral note and mouth-pleasing sensation of creaminess. Beautiful scents of raspberry and cherry on the nose with fresh, clean strawberry and cherry flavors in the mouth and a consistent bead. The finish is clean and crisp and invites another sip. Cristalino Brut Rose Cava is an excellent match for fried appetizers such as calamari or light desserts such as creme brulee. It is also excellent on its own or with fresh fruit. Brut Cava($5.99) – Straw color, smooth and fresh aromas; fine and fruity palate with a dry aftertaste. Clean, dry and crisp with citrus and apple flavors. As for a dessert to pair with your beverage selection stay with a lighter fair as this will work very well with the Champagnes and Sparkling Wines. Fresh non-citrus fruits will work very well as a pairing, think about chocolate covered strawberries and melon type fruits. They are fantastic as a light dessert to go with your wine selection. The whole idea is to really enjoy your evening with your date. WineGuyMike™ recommends choosing a nice beverage that’s within your price range. With the information we have learned about in this Valentine’s Day blog post you will be able to make good choices. Don’t drink too much, it will compromise the enjoyment of your evening. Eat light, you don’t want to feel sluggish or to full and weighed down. Enjoy yourself but approach the evening with moderation of drinking and eating your evening will be much more memorable. Be safe and have a Happy Valentine’s Day. Valentine’s Day Champagne and Sparkling Wines, recommendations, and a few pairings too. Tonight I will be posting many recommendations and food pairings too. 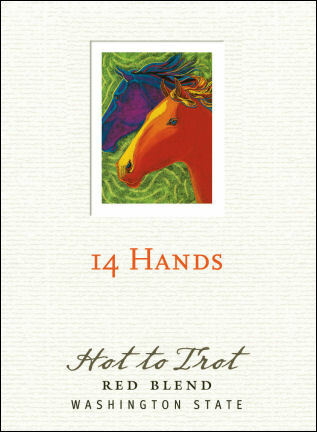 These will be available to you by Sunday’s dawns early light. The current information is through and extensive. If you read this post you will be an empowered consumer of Champagne, Sparkling Wine, Cava, and Prosecco. This week WineGuyMike™ is going to be talking about bubbly Valentine’s Day. First off I’m going to be discussing what the differences are between Champagne, Sparkling Wine, Cava, Prosecco, and Spumante. Then I will suggest what might be great for your Valentine’s Day. Now let’s dig in and get to the bottom of all of this. What is the difference between Champagne and Sparkling wine? Well let’s take a look and find out. Sparkling wines and champagne are still wines that have been infused with carbonation. True Champagne is made in France will be noted by the capital letter “C”on the label. Other sparkling wines called Champagne will by designated as “champagne”, notice no capitalization. Three grapes are used in Champagne, Pinot Meunier, Pinot Noir, and Chardonnay. It’s white because only the juice of the grapes is used. 1. Carbon Dioxide Injection – soft drinks and inexpensive sparkling wines are produced using this method. It produces large bubbles that dissipate quickly. 2. Charmat Process – wine undergoes a second fermentation in large bulk tanks and is bottled under pressure. Prosecco and Asti are produced utilizing this method, smaller longer lasting bubbles result from this method. Many Sparkling wines are made using this method. 3. Méthode Champenoise – this process takes place in the bottle and requires hands on attention. During the second fermentation the carbon dioxide stays in the bottle and this is where the bubbles come from. 4. Transfer Method – the cuvee is bottled for the second fermentation which adds complexity. But the wine is then removed and stored in large tanks after it has spent the appropriate amount of time on yeast. The Champagne region of France not only produces some of the finest sparkling wines in the world, but some of the finest wines in the world too. Typically there are three grapes used in the blend for sparkling wines; Chardonnay, Pinot Noir, and Pinot Meunier. Different vintages are used to create the blend or better known as the “Cuvee”. Champagne is expensive due to the traditional method of how it is made, Méthode Champenoise and techniques known as second fermentation. This process takes place in the bottle and requires hands on attention. Pink Champagne is strained through the Pinot Noir grape skins, truly a delight. Méthode Champenoise is the true French fermentation process. The wine is fermented twice, once in an oak barrel, and the second time the wine developes carbonation in the bottle while aging a minimum of one year. Blanc de Blancs is true French Champagne, it is produced entirely from the Chardonnay grape. Blanc de Blancs fermented using the Méthode Champenoise process, producing white Champagne. This Champagne is the highest priced and is available only in small quantities. It is designated “Prestige” because the grapes come from the best grapes from the highest rated villages, it is made from the first pressing of the grapes, produced only as a vintage, and will have been aged longer than vintage and non-vintage Champagnes. Some select years produce an outstanding grape harvest. The Vintage Champagnes are aged for at least three years. Here are an example of a few companies who produce these Vintage Champagnes; Veuve Clicquot, Perrier-Jouet, Moet & Chandon, and Taittinger. Remember a Vintage Champagne will be identified by an actual year marked on the label, but expect to pay a premium for this. Asti Spumante is a sweet sparkling wine with a mellow effervescence. It is produced in the province of Asti and made from the Moscato grape. Spumante is a fruit forward sparkling wine that is grapy, and has a low alcohol content usually around 8% . Moscato d’Asti is a sparkling wine that is frizzante in style and for my palette I find these wines to be more refined than the Asti Spumante. Sparkling wines from California use a few grape varietals such as Berger and Chenin Blanc to blend with the traditional Chardonnay and Pinot Noir grapes. Producers to look for in California; Hacienda, Domain Lauier, Roederer Estate, Domaine Carneros, Domaine Chandon, Codorniu-Napa, Iron Horse, Jordan, Mumm-Cuvee Napa, and Schramsberg. Remember the name “Champagne” can only be used in Europe on bottles that actually are produced in the Champagne region of France. After all this your head is probably spinning and you haven’t even opened a bottle of sparkly yet, I know mine is. So here we go with a few recommendations, but remember with the information WineGuyMike™ has provided you with you should now be able to approach the shelf as an empowered consumer. You will be able to make the best purchase in your desired price range with this information. Now for the Champagne and Sparkling Wine recommendations. champenoise and adds special oak-aged reserve wines to each blend. L’ERMITAGE is made only in exceptional years, of pre-selected grapes that come from the very best lots. The 2002 vintage was typical of the Anderson Valley cool climate. A dry spring and summer, with very few days of frost or heat, led to a beautiful set of the crop. The pinot had small berry size which led to some concentrated and very aromatic wines. Harvest start dates were August 23rd for Pinot Noir and September 4th for the Chardonnay. Roederer Estate wines are made with juice from just the cuvée pressing; no première or deuxième taille is used. The concept of the vintage L’Ermitage is the same one that is used in Champagne: Only the best of the vintage is selected. These are exceptional wines that create a “noble” (special) blend that allows for longer aging, which produces a fine wine with elegance and finesse. Four members of the blending team include winemakers from Champagne Louis Roederer in France and Roederer Estate in California, together totaling over 130 years of experience. The wine for the dosage added to the 2002 L’ERMITAGE was 2002 wine liquor aged for 5 years in a French oak cask. Following disgorgement, L’ERMITAGE was aged an additional six months (minimum) on the cork prior to release. 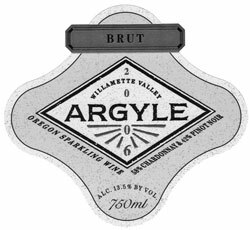 · Argyle 2007 Brut – 90 PT. Wine Spectator Rating, 63% Oregon Chardonnay, 37% Oregon Pinot Noir, Sparkling Wine Knudsen Vineyards, Lone Star Vineyard Willamette Valley AVA, Willamette Valley, Oregon ($25.00) Prepare to be fascinated by this alluring sparkling vintage. The aromas are a weaving together of the best that fine sparkling wines deliver. Look for vanilla spiced pear fruit with very floral citrus blossom scents. A lovely yeastiness blends nicely with fresh baguette bouquet. There’s a hint of Fresca-like citrus in there too. The palate is VIBRANT and chock full of tiny bubbles. Pear to red apple fruit folds nicely into vanilla spice. The texture is creamy-plus, providing amazing richness while remaining zippy and citrusy. The yeast flavor has evolved into filo dough right out of the oven. These flavors go on and on after the wine is gone. 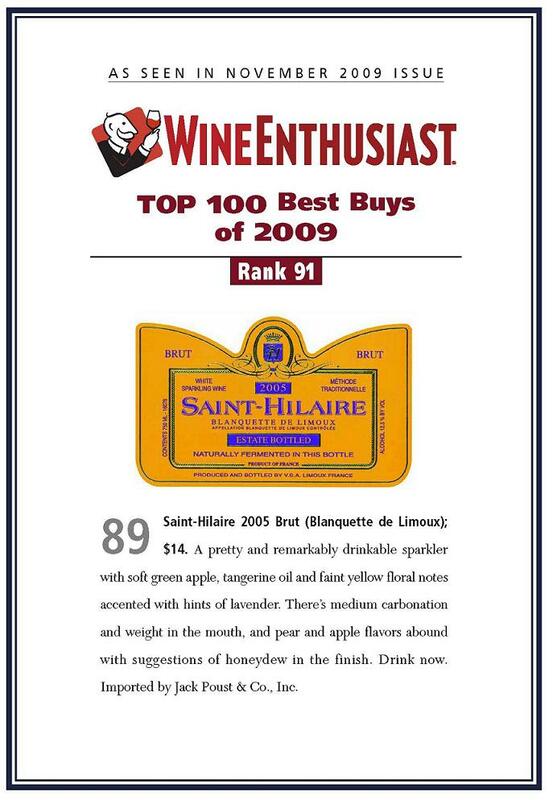 Saint-Hilaire($12.99) – Blanquette de Limoux is probably the oldest sparkling wine in the world. We know that in 1531, the Benedictine Monks of the Abbey of Saint-Hilaire were already producing Blanquette de Limoux which certainly makes it France’s Oldest Sparkling Wine preceding Champagne by more than a century. It is sold in the United States under the name SAINT-HILAIRE in honor of the monks who first created the wine more than 475 years ago. One taste of SAINT- HILAIRE quickly reveals why France’s Oldest Sparkling Wine is also its’ best. The Limoux vineyards are located in Languedoc, in Southern France, at the foothills of the Pyrenees Mountains. The grapes are selected from clay-limestone plots that capture both the Oceanic and Mediterranean influences. Banfi Rosa Regale – In 1979, John and Harry Mariani, family proprietors of Banfi Vintners, acquired a mid-18th century winery, known as Bruzzone, revitalized it and renamed the facility Vigne Regali. Here, with the same detailed care as a century ago, our skilled winemakers produce “Rosa Regale” Brachetto d’Acqui D.O.C.G. This rare Brachetto, a semi-dry, red sparkling wine cherished by the courts of Europe over two centuries ago, owes its reincarnation to Banfi. Rosa Regale is created in one of Italy’s smallest production zones, the Brachetto d’Acqui Denominazione di Origine Controllata e Garantita, commonly referred to as DOCG. It is crafted from 100% Brachetto grapes grown exclusively at the La Rosa Vineyard in the town of Acqui Terme located in the Piedmont region of Italy. The label features a single red rose, representing the wines origin from this single vineyard La Rosa estate. Rosa Regale is produced using the Charmat process. This method forces the second fermentation to happen in large stainless steel tanks prior to bottling, rather than in the bottle like the traditional méthod champenoise. This process is best used on sparkling wines that are meant to be enjoyed young and relatively fresh. Saracco Moscato D′ Asti ($15.00’ish) – Perfume of fresh peach, pear and aromatic white flowers. A gentle sparkle brightens the fruit and a tingle of sweetness hints of candied fruits. This wine is perfect as refreshing aperitif or a light finish to a meal. Saracco has perfected the balance of acid and residual sugar to make an incredibly light and floral sparkling wine. The WineGuyMike Radio Show is moving, so stay tuned. It’s Wine Wednesday Fans and I have a special announcement to make. The WineGuyMike™ Radio Show has moved and there will be no radio show today as a result. My new show will be airing on Sunday mornings at 10:00AM MST. Here is where you can find me; 103.3FM The Trail and 104.5FM Fresh. The first show will be broadcast on Sunday February 13th, stay tuned because this will be a special Valentine’s Day wine show. This is an exciting new opportunity for the show and you my Fans. I have a great line up of guests scheduled that are amazing, so stay tuned and remember to keep asking your great questions. Have a great Wine Wednesday and I will see you on Sunday February 13th at 10:00AM MST on 103.3FM The Trail and 104.5FM Fresh.